When you make a film, or write a book, it’s completed long before the public or critics get to see it. The process of ‘creating’ is clearly separated from the people formerly known as the audience or the reader. But all that has changed, as once physically published objects morph into interactive conversations with the audience. When you make a film, or write a book, it’s completed long before the public or critics get to see it. The process of ‘creating’ is clearly separated from the people formerly known as the ‘audience’ or the ‘reader’. But all that has changed, as once physically published objects morph into interactive conversations with the audience. On September 1st, I published my first app/book for the iPad, The 9/11 Memorial: Past, Present, and Future. The topic was timely, if not somewhat controversial. The idea was simple: to connect the past to the future. I had a wealth of access to footage and images. Through the CameraPlanet Archive, there was a trove of video posted to YouTube that I could cull from. But the ‘past’ began long before the day of 9/11, and so I went back to the 1960s and the building of the twin towers. But the past wasn’t the focus of the app, or the story. What I wanted to do was take readers/viewers through the design, planning, and construction process of the memorial. I had almost 20,000 images, and 300 hours of video, and I knew that for every person who made their way the memorial, there would be hundreds or maybe thousands more that wanted to experience the memorial and wouldn’t be able to make the journey or get tickets. Sharing the story of the 9/11 attacked on New York and the subsequent construction of the memorial was the vision of the app, which I shared in the app description and on the app’s website. 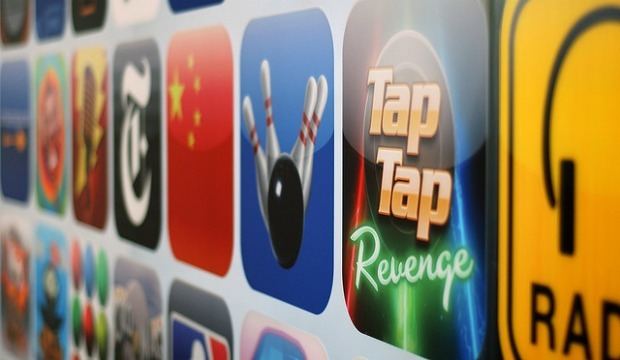 In the first few days it seemed like users got it and embraced the app and its mission. Reviewers from AppAdvice and Apple ‘N’ Apps and iPad Insight each were enthusiastic about the work, and in particular the emergence of a new form of digital storytelling that embraced photos, videos, and text. For those looking for a more personal way to remember the events of September 11, 2001, we strongly recommend The 9/11 Memorial: Past, Present and Future app, available now for iPad. The most refreshing aspect of The 9/11 Memorial: Past, Present and Future app is that it spends most of its time discussing the future. All of the multimedia content seems perfectly suited for the iPad, and I can’t imagine this book in any other format. The 911 Memorial, Past, Present, And Future is unparalleled in the App Store when it comes to meaning and conveying that meaning through wonderful app design. 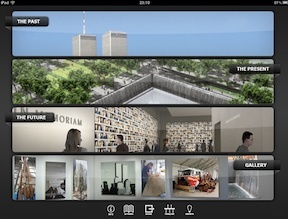 The 911 Memorial, Past, Present, And Future may be the best download for your iPad you ever made. The 9/11 Memorial: Past, Present, and Future is an impressive app. Anyone with even mild interest in the events of 9/11, the history of the Twin Towers, or the present and future vision of the 9/11 memorial will want to spend a lot of time with this app. I could easily see this app ending up in US classrooms, as part of the materials to be used when covering 9/11 in history classes. I feel like I have been given such a gift. It is gorgeously presented and in prefect taste. This app blends the old art of journalism with a new technology in a way that lets consumers enjoy the story in ways that were never possible before. A comprehensive 911 memorial should include events at the Pentagon & Shanksville, PA. Nothing in here about the other two attacked sites? Hardly a 9/11 memorial in that case. My first inclination was to simply ignore the critics. After all, they were complaining that the app didn’t have content in it that I never contemplated. In the spirit of ‘write what you know,” I had written the story of lower Manhattan, a story that I’d been deeply and personally involved in. And so now I have to make a decision. In the world before digital, any oversights or mistakes would simply have been looked at in the rear-view mirror. But my app isn’t frozen in time. In fact, the images and video that I shot at the National 9/11 Memorial this 9/11 is already planned to be a new section in the app when it’s released in its next update. So, what about Shanksville or the Pentagon? Users have spoken, loudly. They want those sites included. And I’m certainly thinking about how to turn those one-star reviews into five star ratings. As a creator and author, is it my job to respond to the audience and update and modify my work to meet their expectations? In the past the answer would have been no. But today, reading the comments, I can’t help but think that the community is looking for something that the app approaches but doesn’t entirely achieve. With that knowledge in mind, it seems like an update may be the right thing to do. Interesting to see the work as a partnership with the readers, rather than something created for them without their input. The app/book is, it appears, really a new thing.